wanderlust ATLANTA: ATLANTApix: Have Fun With Your Photos! 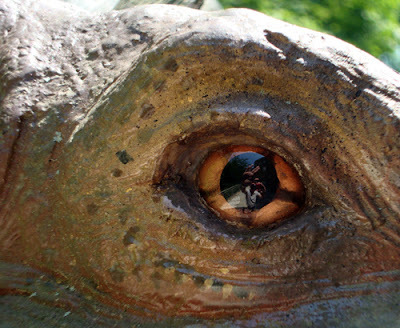 Can You See the Vulcan Salute in the Eye of a Stegosaurus? Vacation photos are some of my favorite, especially the fun ones. Don't get me wrong, I love the ones that turn out like postcards too, but how many of those get comments on Facebook compared to the ones where you were being totally silly and having the time of your life? Have fun with your photos! That's what vacation is for...well, that and relaxing, of course. As much as I love lying on the beach with a cool drink and a good book, I also love sightseeing (tourATLANTA is rather telling of that fact, right?). And vacation is such a great opportunity for some unique photographs. Practically everyone who knows me knows that I'm an overly enthusiastic science fiction fan, especially where Star Trek is concerned. I've recently, almost subconsciously, been creating a series of Vulcan salute photos. This particular photo is especially cool to me because before I wanted to be an astronaut I wanted to be an archeologist. I eventually went to excavation sites in Wyoming and Greece and I also worked in aerospace for quite a few years. I even got to meet Leonard Nimoy in 2002 at the National Press Club in Washington, D.C.
Louis and Mary Leakey were my heroes when I was a kid. If you look closely into the eye of the Stegosaurus, you'll see me offering the Vulcan salute! How's that for connecting two of my life's passions? So, bring your camera and have some fun. You don't have to publish the photos you take, but it's great to have the option to do so instead of never having taken the photos at all...especially the fun ones. "Live long and prosper...and make fun vacation photos!"